No, our family hasn't technically made our way to the New Testament as we read through the Bible chronologically. We are actually in the middle of Ecclesiastes right now, and to be honest, our family needed something else this week. 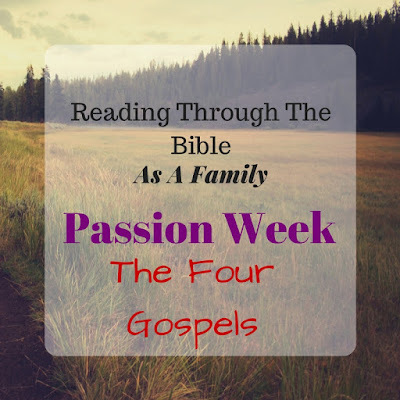 Since it was Palm Sunday, the beginning of Passion Week, I took the opportunity to take a slight detour from our regular reading, and read through the events of passion week chronologically through all 4 of the Gospels. Everyone was excited for a bit of a change. Since I had just spoken that morning at a service we do monthly at an assisted living home, I thought we might breeze through the reading with minimum questions. I was wrong. My husband and I started off by explaining about the first four books of the New Testament being called the Gospels. Well, this was only the beginning of the questions. I'm going to be honest. I learned SO much from this family devotion time! My husband had a small book, The Bare Bones Bible Handbook, that gives just a brief history about each book of the Bible and its author. We learned about what years these 4 books were written, who they were written to, and which ones had an actual personal encounter with Christ. When we started with this brief intro, it opened ALL our eyes to what these four authors were sharing with the reader about Christ's Triumphal Entry. Do you know which book doesn't include "Hosanna" as part of the praise the crowd was crying out to Jesus? Do you know why he wouldn't have included that? I learned so much!! We continued reading on into John where he was talking about the Light. We mentioned that we get the song "This Little Light of Mine" from this song. They were blown AWAY. They had no clue this song was talking about their light being Jesus in their life. They said they just assumed the song was about a candle. We cannot assume our children know just because they've always been in Sunday school, or kids church, or youth group. We cannot assume that someone else has gone over salvation with our children or other loved ones. While this situation was no where near that extreme, it serves as a reminder. Ask questions, see what they do know. The conversations are so fun and full of blessings! 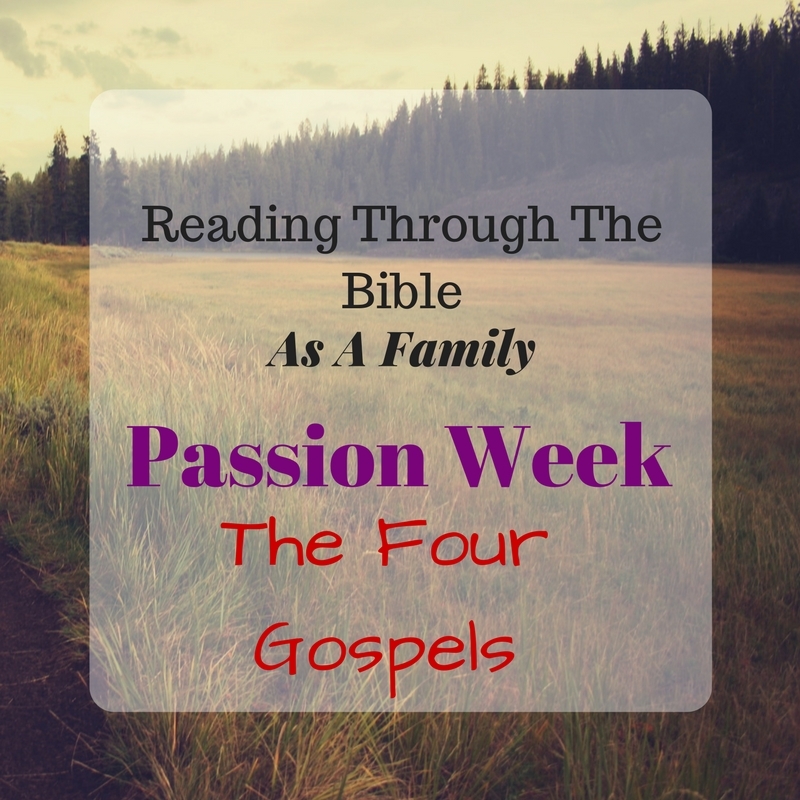 If you would like to read through the four Gospels chronologically for the events of Passion Week, click here to be taken to a list of scripture readings by the day.